Front and back covers by Bob. 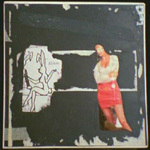 Front cover shown in the Watch Me Jumpstart video. Front Cover Image (minus the number) also appears in Vampire On Titus/Propeller combined CD booklet along with a picture of the Back Cover.